Create glamorously different looks with just one sweep of China Glaze® Crackle Glitters. Layer over different base colors to create bold styles. Use a lightercoat to create a fine crackle, a thicker coat for a deep shatter effect. Brush sideways or on an angle to create different looks. 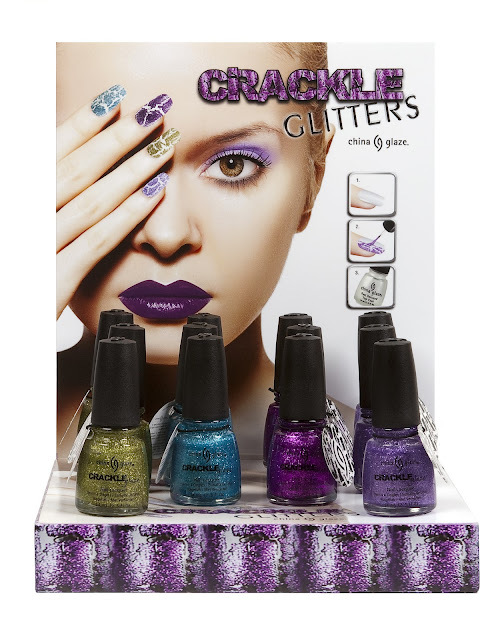 As versatile andedgy as China Glaze®’s biggest celebrity fans (Lady Gaga,Rihanna, Nicole Ritchieand Kelly Osbourne, to name a few), China Glaze® Crackle Glittersadd a spark(le) to one of the hottest nail art trends! TheChina Glaze® Crackle Glitterscollection will be available as open stock colors and four-piece counterdisplay. Individual polishes retail for $9 MSRP and will be available atfine salons and beauty supply stores nationwide in May 2012. I love China Glaze but I confess that I'm not into this crackle thing! Crackle Effect looks amazing I will have to try it.